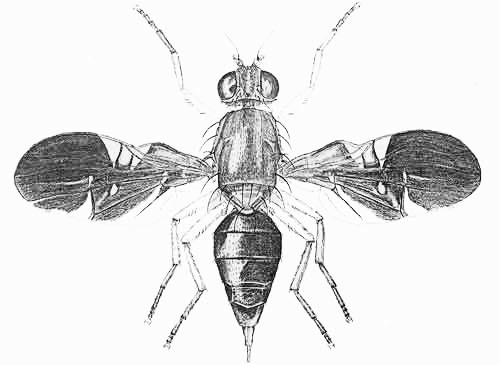 Several of the native picture-winged flies in the family Ulidiidae often are confused with fruit flies in the family Tephritidae. While the females of most species of Tephritidae oviposit in living, healthy plant tissue and their larvae live and feed in various parts of the plant, the larvae of most species of Ulidiidae are saprophagic. However, a few, such as Tritoxa flexa (Wiedemann) and Tetanops myopaeformis (Röder), attack living plant tissue. One of the picture-winged flies in Florida most often mistaken for a true fruit fly, some of which are important pests of citrus and other fruit, is Delphinia picta (Fabricius). Although the larvae of this fly have been collected from fallen ripe plums, well decayed (verbal report from G.C. Steyskal 1970), Delphinia picta larvae do not attack fresh, healthy fruit. Figure 1. Adult Delphinia picta (Fabricius), a picture-winged fly. Photograph by Charles Schurch Lewallen, bugguide.net. 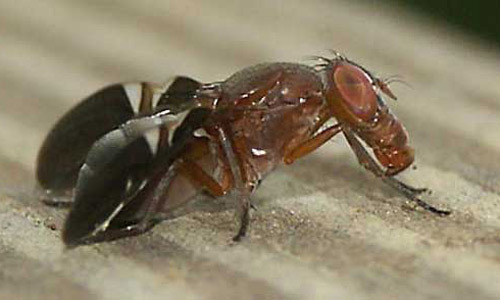 Delphinia picta, one of the most common and attractive flies in the family Ulidiidae found in North America, is reported to occur from Maine westward to Minnesota and southward to Kansas and Florida. Detailed descriptions of the egg, three larval instars and puparium are given by Allen and Foote (1967). The adult is readily recognized by the distinctive wing pattern, shiny blackish-brown with slight overtones of yellow in a few places on a hyaline background. Average length of wing is 6 mm and average body length from head to tip of abdomen excluding the ovipositor is 7 mm. Head and thorax are light brown; abdomen black; legs light brown to yellowish-brown. Figure 2. Adult female Delphinia picta (Fabricius), a picture-winged fly. Photograph by Division of Plant Industry. Figure 3. 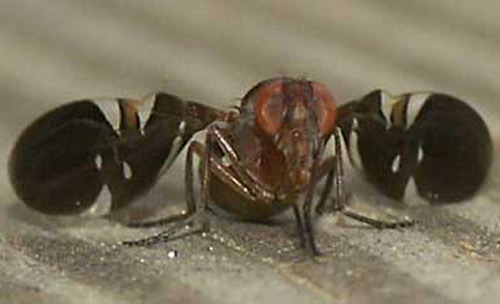 Lateral view of an adult Delphinia picta (Fabricius), a picture-winged fly. Photograph by John Fox, bugguide.net. Figure 4. 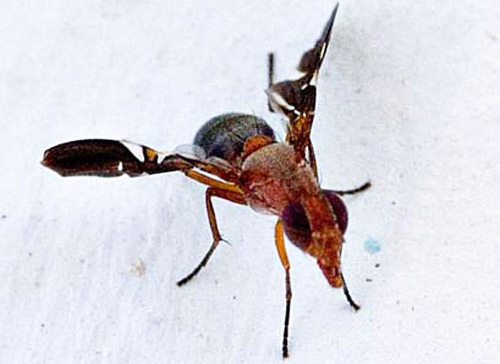 Lateral view of an adult Delphinia picta (Fabricius), a picture-winged fly. Photograph by John Fox, bugguide.net. The ovipositor, approximately 1.25 to 1.30 mm in length, is characterized by one ventral and two dorsal prominent pairs of long setae plus several pairs of short setae on both surfaces, and at the tip and by a slight bending downward of the tip of the ovipositor. Figure 5. Lateral view of ovipositor. Drawing by Division of Plant Industry. Allen and Foote (1967) recorded that "In northeastern Ohio, adults . . . were found from mid-May until late summer. The premating period averaged less than two days; the preoviposition period after mating was three to seven days. Field-collected females each deposited 400 to 500 eggs in decaying herbaceous vegetation. Eggs hatched in four to seven days, and larvae given rotting vegetation completed their development in 20 to 31 days. Larvae of the first generation pupated, with adults emerging 12 to 15 days later, but increasing percentages of the larvae of the second and subsequent generations entered diapause. "Overwintering took place as diapausing mature larvae in the soil. In early May, perhaps in response to warming soil temperatures, the larvae migrate toward the ground surface and form puparia. The rearing records indicate that Delphinia picta is a multivoltine species, with a facultative larval diapause which probably is induced by decreasing day lengths. Adults reared from puparia usually lived less than 40 days in the laboratory, although one female remained alive for 69 days. Males generally died first. Mating occurred within two days after adults emerged in the breeding jars. Mating occurred repeatedly during the life of the female, with each mating lasting approximately an hour." Larvae of this fly feed on accumulations of badly decayed, sodden vegetation lying on the surface of the ground or partially buried in the soil, on rotting fruit, and on other kinds of decomposing vegetation, including bulbs of commercial onions and wild garlic (Allen and Foote 1967). Blanton (1938) reported rearing adults from larvae in decaying narcissus bulbs. In northeastern Ohio, adults were found most commonly on herbaceous vegetation near garbage dumps and refuse heaps. A few were taken in deciduous woodlands and at the edges of wooded swamps (Allen and Foote 1967). Virtually nothing has been recorded on larval hosts and habits in Florida. Allen and Foote (1967) found that in the laboratory adults fed readily on honey-brewer's yeast mixture in breeding jars and in nature were seen feeding on accumulations of sodden vegetation. Steyskal (1951) observed adults feeding on fermenting beetle frass protruding from the bark of a black locust, Robinia pseudo-acacia L.
Allen EJ, Foote BA. 1967. Biology and immature stages of three species of Otitidae (Diptera) which have saprophagous larvae. Annals of the Entomological Society of America 60: 826-836. Blanton FA. 1938. Some dipterous insects reared from Narcissus bulbs. Journal of Economic Entomology 31: 113-116. Steyskal GC. 1951. The dipterous fauna of tree trunks. Papers of the Michigan Academy of Sciences, Arts, Letters (1949) 35: 121-134. Steyskal GC. 1965. Otitidae. pp. 642-654. In Stone A. et al. A Catalog of the Diptera of America north of Mexico. USDA Agricultural Handbook 276. 1696 pp. Originally published as DPI Entomology Circular 96. Publication Date: July 2006. Latest revision: December 2009.